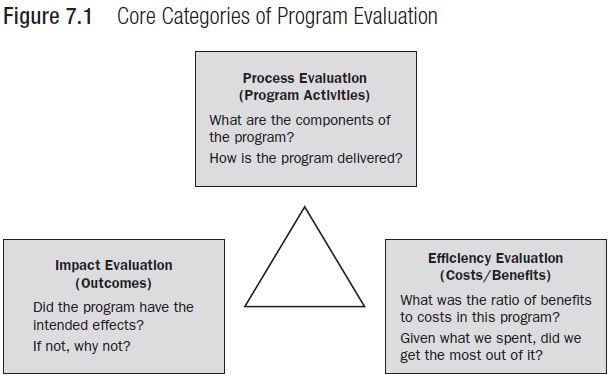 Leslie Pal (reference below) sets out the three broad categories of program evaluation. These are elaborated at: Process Evaluation; Efficiency Evaluation; Impact Evaluation. See also: Policy Analysis and Policy Evaluation; Contrasting Purposes of Evaluation. The Study of Evaluation and Performance Measurement (core topic) in Evaluation and Performance Measurement and Atlas108 Analytic Methods and Evaluation. Newcomer, K. E., Hatry, H. P., & Wholey, J. S. (2010). Planning and designing useful evaluations. In J. S. Wholey, H. P. Hatry, & K. E. Newcomer (Eds. ), Handbook of practical program evaluation (3rd ed.). (pp. 5–29). San Francisco, CA: Jossey-Bass. Page created by: Ian Clark, last modified 28 September 2017. Image: PHC Group Consulting, at https://www.linkedin.com/pulse/program-evaluation-samer-faissal, accessed 10 April 2017.